BJJ GI – Brazilian Jiu-Jitsu grappling class focused on developing skill with the gi. Class includes technical development and free grappling. High emphasis on both technique and physical fitness. BJJ NO Gi – Grappling class focused on developing skill without the gi. Class includes technical development and free grappling. High emphasis on both technique and physical fitness in this Brazilian Jiu-Jitsu class. Cardio Thai Boxing – High-intensity class focused on bag work and conditioning drills. Students will practice a variety of strikes, including, punches, kicks, elbows, and knee in a format designed to develop skill and stamina. This class has a higher focus on fitness and caloric burn. It combines Muay Thai, Boxing, and interval training to get a great workout! 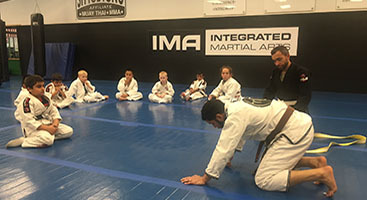 IMA MMA – This class focuses on integrating grappling and striking skills drawn from a variety of systems (Muay Thai Kickboxing, Brazilian Jiu-Jitsu, Judo, Taekwondo, Wrestling). The class includes technique, drills, and sparring that is scaled to the skill and intensity level of each student. 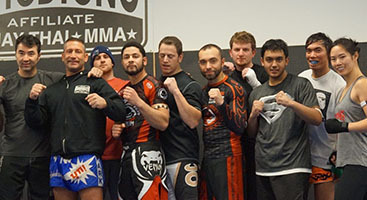 This class has a high focus on self-defense technique and a medium on physical fitness. Kids’ Martial Arts – Martial arts for kids ages 4–15. 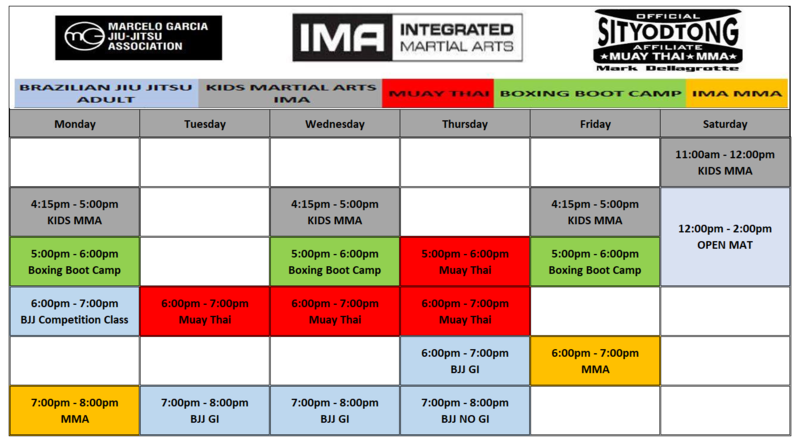 Classes will cover elements from the entire IMA curriculum, including striking, grappling, and self-defense. Muay Thai – Striking class focused on technique and skill development. Class includes partner drills, pad work, bag work, and clinch work. High emphasis on both technique and physical fitness. Open Mat – Free time for students to use the training facility as they see fit. This can include working with a training partner on specific skills, seeking help from an instructor, or just sparring or rolling with training partners.